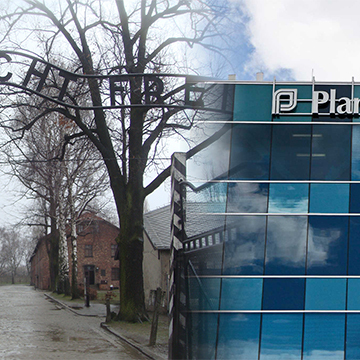 Planned Parenthood and the Moral Blindness of the Holocaust, Part 3. So what do we need to learn from this? I believe we need to learn not to let a biased media blind us to plain sense realities. Herman Wouk, in War and Remembrance talks about “the will not to believe.” One character, Slote, is trying to persuade the American Ambassador in Bern (Switzerland) to take seriously the evidence of the Holocaust. The other character, a priest, is warning him of the difficulties. The public media in our country is imbued with “the will not to believe” that a moral (and probably legal) wrong is taking place in Planned Parenthood clinics. Any explanation, no matter how thin or patently off-subject, is preferable to the truth that abortion is evil and its grisly consequences are disgusting. This moral blindness is presented in condescending, professional, slick packages that make us want to agree, to be persuaded that they are telling the truth. Like the Germans, we want to believe that nothing bad is happening behind those walls, those fences, despite the stench that sometimes wafts over. We need to remember the plain sense of what we are seeing. When someone stands over a tray of murdered baby body parts and lifts a little arm or leg with offhand irreverence, that is moral evil, no matter what explanations, excuses or rationalizations have been given. We must not accept the central premise of the abortion industry, that this is just tissue, subhuman “products of conception.” We must cling to the truth that every human being, especially the helpless unborn, has dignity and incredible worth. One of my least favorite Bible verses, for many years, was Proverbs 29:18. It was commonly translated ‘without a vision, the people perish,’ and was used to encourage Christian leaders to invest huge amounts of energy in ‘vision casting’ rather than in the more mundane forms of Biblical ministry. But when the NIV came out in 1984, it translated the verse ‘without revelation the people cast off restraint,’ and even a person not educated in Hebrew can dig a little and find that this is a much better translation. When a people rejects God’s Word as a reference point for their morality they cast off all moral restraint. It happened in Nazi Germany, it happened in Stalinist Russia, and it is happening in Planned Parenthood. The abortion industry in the United States, grounded in the spurious value of “choice,” has cast off all restraint. The ‘donation’ of body parts from babies born alive seems laudable to them. Any procedure or modification of procedure that is needed is acceptable, as long as one is willing to pay for the line item. Any euphemism, deception or outright lie that protects this major contributor to Planned Parenthood’s bottom line is to be embraced. We must not let the morally blind persuade or sway us. Isaiah 8:11-13 For the LORD spoke thus to me with his strong hand upon me, and warned me not to walk in the way of this people, saying: 12“Do not call conspiracy all that this people calls conspiracy, and do not fear what they fear, nor be in dread. 13But the LORD of hosts, him you shall honor as holy. Let him be your fear, and let him be your dread. Isaiah 8:20 To the teaching and to the testimony! If they will not speak according to this word, it is because they have no light of dawn.